In recent times, however, it seems there is a surge in the number of reported acts highlighting caste-based violence. 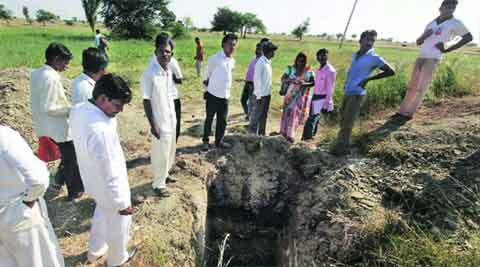 Three members of a Dalit family in Maharashtra’s Ahmednagar were killed, one of them decapitated before being thrown into a dry well in Jawkhede Khalsa village, on the night of October 20. The investigation is still on and the jury out on whether it was an act of caste violence or the result of a dispute. In recent times, however, it seems there is a surge in the number of reported acts highlighting caste-based violence. Ahmednagar district seems to have acquired a dubious distinction for being most violent against Dalits. In this district, about 44 cases of atrocities were registered in 2012, which increased to 112 in 2013. About 79 cases had been already been registered till October 2014. In Maharashtra, during a 16-year period between 1995 and 2011, about 4,256 cases of atrocities were registered under the atrocities act by Dalits, which comes to about 266 cases per year. What is striking is that while there was a decline in the per year cases from 343 in 1995 to 136 in 2002, thereafter the numbers have increased steadily, from 136 in 2002 to 304 in 2012. This increasing trend in atrocities indicates the persistence of caste, with increased intolerance and violence against Dalits. Caste discrimination and violence is a national problem. However, little is known about the day-to-day occurrence of this practice. The India Human Development Survey (IHDS 2), conducted by the National Council of Applied Economic Research (NCAER) and the University of Maryland in 2011-12, asked the respondent a direct question: “Does anyone in your family practise untouchability?” In case the response to this question was in the negative, a follow-up question was asked, “Would it be okay for a Scheduled Caste person to enter your kitchen or use your utensils?” The idea was to know, assuming a household had acquaintances who belonged to the lower castes, if they would have free access to household utensils and, say, even the kitchen, supposed to be the purest part of the household. The IHDS is the largest non-government, pan-Indian household survey. It covers over 42,000 households, representative of class and social group. of purity or pollution takes strange forms, indeed. The break-up of those who agreed to practising untouchability across social groups shows that the largest practitioners are from among the Brahmins (52 per cent), followed, interestingly, by the OBCs (33 per cent), as opposed to the forward castes (24 per cent). Is this indicative of the growing tension between the OBCs and SCs, arising from economic competition? Only further research can tell. 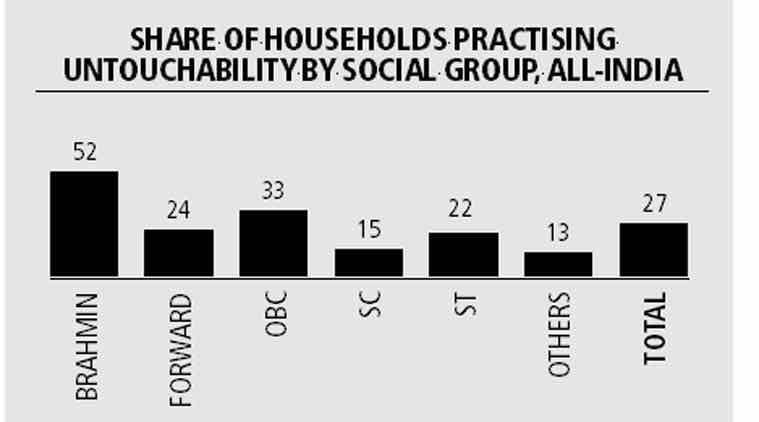 Interestingly, the SC (15 per cent) and Scheduled Tribe (22 per cent) households also reported practising untouchability, but to a much lesser extent. The prevalence of untouchability among the SCs could either be due to the sub-castes among them — the higher sub-castes practising discrimination against the lower ones in some spheres, if not all. Or, it could be due to the practice being so internalised by them that their positive responses could be indicative of the SCs following the regressive caste norms set for them by the higher castes. We also found the prevalence of the practice to be higher in rural areas, where religious practices and beliefs are more of a norm. The same break-up across religious groups shows an even more intriguing pattern. 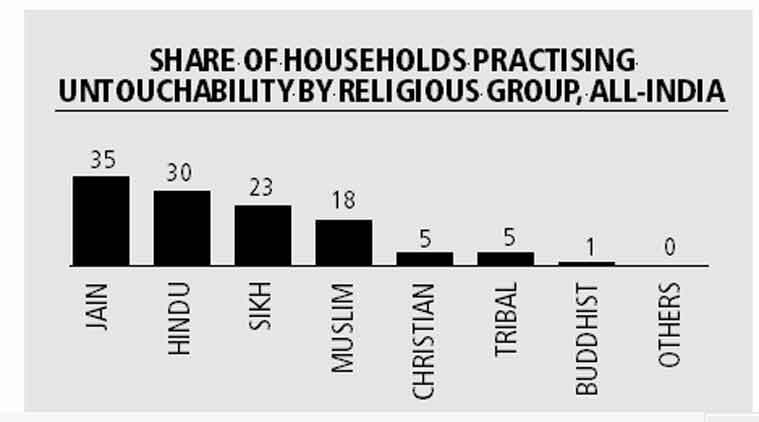 Jains show up as practising untouchability the most (35 per cent), followed by Hindus (30 per cent). The results for Jains are not conclusive because of the small sample in the survey. Surprisingly, Sikhs (23 per cent) and Muslims (18 per cent), too, confess to this practice. These findings indicate that conversion has not led to the total change of mindset that was hoped to be achieved and caste identity is a sticky baggage difficult to dislodge. Our analysis, however, shows that the practice falls with a rise in education. So, while 69 per cent of Brahmin households, where the highest adult education was between classes one and four, said they practised untouchability, only 45 per cent of households agreed to the practice where any adult in the household had graduate-level education. Education seems to reduce the prevalence of the practice the most amongst the Brahmins and the OBCs. Interestingly, the level of household income does not make any difference. The difference between the poorest and the richest households claiming to practise untouchability was a mere 2 per cent in rural and 1 per cent in urban areas. 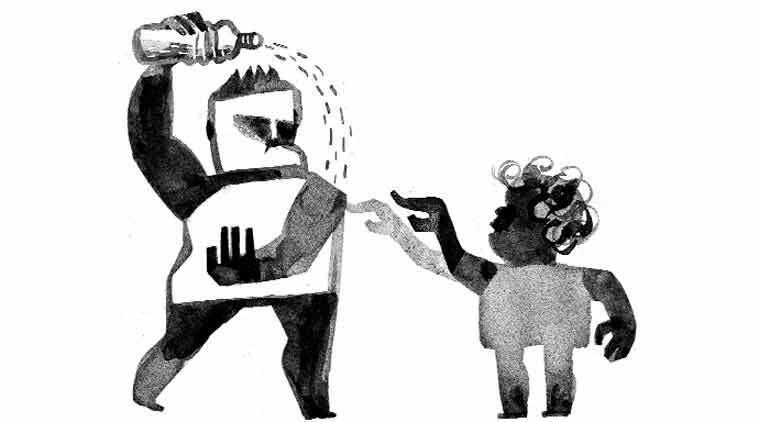 Clearly, caste discrimination tends to remain neutral to the economic standing of people. The states that show up as the top ones with respect to the practice of untouchability are Madhya Pradesh at 53 per cent, Himachal Pradesh at 50 per cent, Chhattisgarh at 48 per cent, Rajasthan and Bihar at 47 per cent each, Uttar Pradesh at 43 per cent, and Uttarakhand at 40 per cent. States with the lowest incidences are Andhra Pradesh at 10 per cent, the entire Northeast at 7 per cent, Maharashtra at 4 per cent, Kerala at 2 per cent and West Bengal at 1 per cent. The data show that 70 per cent of households denied practising untouchability. Even assuming that many respondents were uncomfortable with revealing the truth, this indicates an evolving trend. But it is a long road ahead to when we might manage to erase the practice from our minds and our deeds. The writer is an associate fellow at the National Council of Applied Economic Research and is part of the IHDS team.